﻿You'll find here an history of all the updates I've done to the website since its creation. Of course, some information can be now obsolete, but I thought that you might be interested to know how the website evolved through the years to become like it is today. If you want to be kept informed when major modifications will be made to this website, you can subscribe to the newsletter, but you first need to create a member account. You can also use the RSS (Really Simple Syndication) feeds of this website to automatically receive the news in your web browser, mail client, or any other RSS-compatible software. Two feeds are available: one can be used to receive the news in English, while the other can be used to receive them in French. They're updated each time a news is being published on the website. You can choose to receive one of these feeds, or you can also subscribe to both. This website has been online for 18 years! To celebrate this event, you can now benefit from a new way to get the latest updates from the website, even if I don't add any news about them. Most updates focusing nowadays on the arrangements made by users of Arachno SoundFont, who keep adding new contents on YouTube or SoundCloud on a regular basis. To help you remaining up-to-date with the regular new additions, you can now choose to receive them as RSS feeds, just like you could do with the news until now. These feeds can help you to automatically receive the new arrangements in your web browser, mail client, or any other RSS-compatible software. For more information on those feeds and their use, check the Arachno SoundFont arrangements page. My SoundCloud account became somewhat popular the day I chose to build some giant playlist, featuring all tracks I used to love on this platform, sorted in a logical order. So, I simply thought I should share these playlists with you today. Featuring famous sounds from the best synthesizers ever, including Roland D-50, Korg M1, Yamaha DX7... just like Arachno SoundFont. If I had to comeback to the music scene - and I hope I will, one day - I would chose to produce music in this style. So, stay tuned for more exciting contents, these playlists are updated on a very regular basis! Several Arachno SoundFont users recently released some exciting new tracks, so I thought it was the right time to feature them with some special news. First of all, NightFright, who previously released several music packs from famous video games (DOOM, Duke Nukem 3D...), just unveiled a new YouTube playlist of a totally new soundtrack, composed by James "Jimmy" Paddock, for the Duke It Out In D.C. extension pack for Duke Nukem 3D, released in 1997. And I'm very proud to announce that both chose Arachno SoundFont to record the whole soundtrack, "for best overall quality", and, "in [their] opinion, the result is absolutely fantastic". 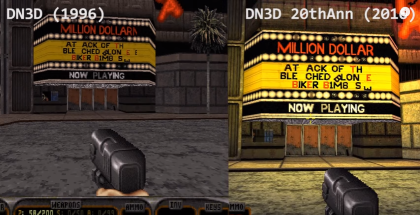 So, you have to check it out on the Duke Nukem 3D High Resolution Pack website! Klaus Jupitz, a long-time and loyal Arachno SoundFont user, also decided to permanently release all his tracks on his YouTube channel. His work is really impressive, being either original compositions - including a track inspired by my own Arabian Feelings and Green Hills tracks - or covers of famous 80's music. He also gives me precious feedback on the SoundFont itself, and I really appreciate his support! On a similar note, Ronald Karle is a new Arachno SoundFont user who releases original tracks, mostly featuring strings like violins, at a very fast pace. And, to finish, MyNewSoundtrack is a quite popular YouTube composer who releases covers of video game music, and some of his releases are featuring Arachno SoundFont in a very-well mixed version. Check out Sewer' Surfin cover from TMNT: Turtles in Time! Once again, I'm extremely proud of the popularity of Arachno SoundFont among users from all around the world. Since its release in 2010, the SoundFont has been downloaded nearly 100,000 times, just from this website. This is truly awesome, and I can only thank you a billion times for your support! The Arachno SoundFont user arrangements count keeps growing everyday, and I thought it was time, to celebrate the website's 16th birthday, to think about some additional tools to better find those you're willing to like the most. On the Arrangements page, you'll now find two additional filtering criteria: either by subcategory, such as games, film or song covers, or, most importantly, by keywords. So, you can now click on arrangements' titles, composers, and other metadata to filter only those corresponding to this data - or even input your own keywords. Thanks to Lee Jackson Audio Community on Facebook, I discovered that a new edition of Duke Nukem 3D, "20th Anniversary World Tour", has been released on PC (Steam), Xbox One and PlayStation 4 two days ago, featuring a whole new episode, and new music composed by Lee Jackson himself. Then, I found this YouTube video, comparing the original edition from 1996, the "Megaton Edition" from 2013, and this new "World Tour" edition from 2016. And I discovered that ALL the music tracks bundled within the Megaton Edition were actually remastered OGG versions of the original MIDI files... recorded with Arachno SoundFont! However, I never got any notification about this. So, I never knew that my SoundFont had been used this way for over one year... and so, indirectly sold on Steam by the way. Not to mention that the OGG files didn't even come with any credit information mentioning that they had been recorded with my sounds. Now that this Megaton edition has been withdrawn from the Steam stores (to avoid cannibalizing sales of the new World Tour edition), I wish I didn't learn this fact this way. But I'll always be happy to notice that my Arachno SoundFont bank can be even more popular that I may already know! 05-01-2016 (10.4) : New "medley" arrangement from Super Mario World. I just released a new official arrangement made with Arachno SoundFont. It's a medley of the introduction and map themes from Super Mario World. This arrangement is based on several MIDI files composed by various artists: Erik, Sword-Bolt, The Ultimate Koopa, Mark Jansen, Daniel Lippert, The King Samon & JILost. As usual, you can download all the audio tracks from my SoundCloud account, or directly in MP3 or OGG formats, both archives including the original MIDI files. Of course, I also keep adding new arrangements from the Arachno SoundFont users. The list keeps growing quickly, and should soon break the amazing 1,000 arrangements mark! BIG THANKS TO ALL CONTRIBUTORS! Remember to keep an eye on my YouTube and SoundCloud playlists featuring new contents and tracks from the most active Arachno SoundFont users, as I'm updating them on a very regular basis; you can subscribe to my YouTube, SoundCloud and Google+ accounts to keep track of these new contents! On this website's 15th birthday, I'm proud to announce that there are more and more users of Arachno SoundFont releasing new arrangements made with this sound bank. As a result, I'm constantly updating a list of tracks made with Arachno SoundFont. This list grew up to more than 800 tracks today, so many thanks for your support! That's why I decided to add, on the left part of this website, a new part which will automatically show all new arrangements which will be added here, without necessarily being focused on the front page. Remember that you can always browse my YouTube and SoundCloud playlists, where I'm always adding new stuff made by the users of Arachno SoundFont; you can also subscribe to my YouTube, SoundCloud and Google+ accounts if you want to be notified when new stuff is being added. I also have to thank you towards my latest video arrangement, Super Mario Bros. - Underground Theme (Remix), which has now reached the 10,000 view mark in only 6 months, more than any other video I released since 2009! 05-15-2015 (10.2) : New "underground" arrangement from Super Mario Bros. I just released a new official arrangement made with Arachno SoundFont: the extremely popular underground/cave theme from the Super Mario Bros. video game series. This arrangement is based on a remix uploaded at VGMusic.com in... 1998, as you can read here. As usual, you can download all the audio tracks from my SoundCloud account, or directly in MP3 or OGG formats, both archives including the original MIDI file. Moreover, I also added some new arrangements from the Arachno SoundFont users. As there are many of them now (more than 600! ), I also enhanced the Arrangements page with a pagination system, which will speedup the page's loading times. I also slightly updated the Flat and Coloured Theme introduced on this website some months ago, with some minor cosmetic fixes. 03-15-2015 (10.1) : Some theme enhancements and new user arrangements. The newly-introduced Flat and Coloured Theme has been slightly enhanced, with a new, lighter background image, to enhance text readability and visual comfort furthermore. During the last few months, I also kept updating my "Made With Arachno SoundFont" YouTube and SoundCloud playlists with new contents and tracks from the most active Arachno SoundFont users, which are progressively added on the user arrangements page for your convenience. Remember to subscribe to my YouTube, SoundCloud and Google+ accounts to keep track of these new contents! 12-04-2014 (10.0) : A brand new color theme for Arachnosoft's 14th birthday. Arachnosoft is turning 14 today. Considering that its black textured color sheme had been released on it's 4th birthday, I thought it was time to cleanup the dust! As a result, you can now enjoy a brand new color scheme and theme, focusing on flat and colored shapes, to enhance overall text readability and visual comfort. Built with newer browser technologies, this new theme will allow me to optimize the website for several, modern devices like smartphones and tablets. I'll continue to enhance it with further updates, adding more dynamic contents. Feel free to contact me to tell me what you think about it! In case you'd like to switch back to the older, classic theme, you can also do it by clicking on the link available on the top left of the page. Moreover, as usual, I also kept adding new arrangements made by users of Arachno SoundFont: the list has reached more than 500 titles so far, so check them out! 216. It's the impressive number of YouTube videos I found these last two months, making partial or complete use of Arachno SoundFont. Whether being original tracks, tutorials, video game music or walkthroughs, song or movie music covers in MIDI format, I had to make a tribute to all YouTube users who chose Arachno SoundFont to power their tracks, sheet music and video game sessions. Among those 216 newly added videos, half have been released on YouTube these last two months; a nice proof of some users' huge activity, who can even release several videos per day! Among the newly added users on this website, I invite you to discover the videos released by pianist1998 (a very active user, who writes various sheet music and plays thems through MuseScore, Synthesia and others, just like BobGmbH does) and sonickun95 (who produces excellent video game music covers with FL Studio, exclusively using Arachno SoundFont). You can also discover new works by Sakai Ryuuji (MrZaTaNaX), PiMan31415926535879, Jacob Kowanetz, Andrew Porter and Zuri Watu, as well as "Black MIDIs" by GeekyMusic, TheSqrtminus1 or Gingeas, who are always trying to beat their own record of building MIDI covers using hundreds of thousands, not to say millions of notes. And if you're a video game addict, you should have a look at the videos released by David O'Neill, Runefox and Paul Peter, just like those of The Ultimate Doomer and Bionicman (Xeros612), to name a few. The growing popularity of Arachno SoundFont, which has been downloaded more than 60 000 times in nearly 4 years, is the best reward I could ever expect. Big thanks to all of you! Today, I'm releasing some new arrangements from The Legend of Kyrandia, a fantasy adventure game developed by Westwood Studios in 1992. This new MIDI arrangement video covers 6 music tracks from the introduction and first level of the game: the main theme, followed by three other introduction tracks, and two other tracks heard by the player as soon as he starts to play: "Speech of the Land" and "Outside Brandon's Home". All tracks are from the original MIDI files by Frank Klepacki, that I converted from the original Roland MT-32 synthesizer map (the de facto standard for PC MIDI soundcards at this time) to GM (General MIDI) tracks, so they can be played with Arachno SoundFont. Hope you'll like this new addition! Of course, you can download all the audio tracks from my SoundCloud account, or directly in MP3 or OGG formats, both archives including the MIDI files. Moreover, I also added some new arrangements from the Arachno SoundFont users, and a link to the MuseScore open-source notation software, which is widely used by MIDI enthusiasts to write sheet music, along with Arachno SoundFont. My Arachno SoundFont users have been very active these last months. I've first been very excited to find that a user named Don Allen released a SoundFont named Timbres of Heaven, which is partly based on Arachno SoundFont. With another man named Dan West, they are members of a Yahoo! group named MIDKAR, which releases MIDI arrangements on YouTube featuring Don Allen's SoundFont. I'm currently planning to update the website with a new section dedicated to SoundFonts using instruments, presets or samples from Arachno SoundFont, like Timbres of Heaven. I also had the real pleasure to discover BobGmbH's videos, a very active YouTube user known for his "IMPOSSIBLE REMIXES" videos. BobGmbH uses Arachno SoundFont to record, using Synthesia, piano covers of famous tracks, either being from games or movies, or even original tracks. Additionally, some well-known Arachno SoundFont users, like Cose Vidal and Ultimate Doomer, released some excellent arrangements worth listening to. Ultimate Doomer has released, among a few others, a new recording of "Grabbag", the main theme from the Duke Nukem 3D game, in its extended version (the same as the one you could hear on the CD-ROM version of the game), thanks to the original composer, Lee Jackson, who found the time, at least, to release the full, complete version of the original MIDI file. NightFright updated his Duke3D Arachno Music Pack to feature this new track; so, I also updated the pack hosted on this website to reflect this change. All this new stuff is now available on the Arachno SoundFont users page, which now features an updated layout to reflect the hard work of the most active Arachno SoundFont users, and their latest releases. This page will ultimately feature some information on each author, which will differenciate it from the MIDI arrangements made by Arachno SoundFont users page, which will remain focusing on the arrangements rather than the authors themselves. That said, I also updated this page so you can now filter the arrangements list by author. I'll continuously (and silently) update these webpages with the new arrangements I'll find, like I did these last months. I just wanted to feature the latest additions with this new page layout and website update to thank you all for your support. I should also update my Dell Venue 8 Pro review very soon, to cover the use of the GPS chip which actually sits in the 3G/HSPA+ versions of the tablet, which has been discovered thanks to the investigations of the Hardware.fr forum members. I recently bought a Dell Venue 8 Pro, an 8-inch Windows 8.1 touchscreen tablet, allowing you to execute the very same applications than those you can already run on a Windows PC. And, after more than 15 days of extensive use, I followed the advice given by members of the French Dell Venue 8 Pro topic on Hardware.fr, and decided to write my own review in the Articles section. I decided to do so after having spent many hours to choose this tablet, facing difficulties because of the lack of complete reviews of this tablet, notably on some features I was very interested in (stylus, external screen display). This review thus covers, over nearly 20 pages, all the features I tought it'd be worth mentioning, even more after reading Pierre Lecourt's excellent review (in French) of the Asus Transformer T100. Hoping that my experience will help you to make your choice, if you're also looking for an 8-inch touchscreen tablet running Windows 8.1, either being the Dell or one of its competitors (Acer Iconia W4-820, Lenovo Miix 2 8, Lenovo ThinkPad 8, Asus VivoTab Note 8 and Toshiba Encore WT8). Important note: this review has been translated by myself from the French article I released on this website some days ago. Given the extensive length of this publication, the English version may still contain very approximative and mistaken language translations. If you notice grammar or spelling mistakes in this review, don't hesitate to report them to me. Thanks! Thanks to NightFright and other Arachno SoundFont users, I discovered some additional software to help you convert your MIDI files into audio files (like MP3) in a single, hassle-free process. To promote these software products, I thought that I had to build a new Links section dedicated to SoundFont software, into which I moved CoolSoft VirtualMIDISynth, BASSMIDI Driver and SynthFont, which were previously featured into the Arachno SoundFont promoters page. In this new section, you'll find AIMP3 and Piston Software's Direct MIDI To MP3 Converter which will help you to record your MIDI files with sounds from Arachno SoundFont. Note that Piston Software supports Arachno SoundFont, and offers a 30% discount to all Arachno SoundFont users with the following coupon code: ARACHNO30. Check this software which will save you many time if you're recording MIDI files into audio files, just like NightFright did to record the Arachno SoundFont video game music packs! I also added two new arrangements recorded by users of Arachno SoundFont: Vengeance" an original composition by Eris Falling (composer of a large number of tracks for additional DOOM levels, such as the Plutonia series), and an awesome cover of "The House of The Rising Sun" by Richard "Ricky" Forhenson. Thank you all for your continuous support! After introducing massive contents made by Arachno SoundFont users these last months, including the Arachno SoundFont Game Music Packs by NightFright, I thought it was time to release some new stuff on my own. I recorded a new arrangement from The Legend of Zelda: Ocarina of Time. It's the theme of the Kokiri Forest map, which is the first playable level of the game, right after the introduction video. This theme was originally composed by Koji Kondo, and the MIDI file used to record the arrangement was composed by John Kuzma. You can play or download this arrangement right now! Moreover, I also added some new user-made arrangements I found, including "Ionian Isolation" an original composition by Eris Falling (who composed many tracks for DOOM add-on levels such as the Plutonia series), "Gentle Moments" another original composition by AbstractGarden, a recording of DOOM 2's original MAP01 music known as "Running From Evil" by Federico Dossena, and two MIDI covers rendered with the MIDIJam software by PianoKid0051: Joe Cocker's "Unchain My Heart" and Avicii's "Wake Me Up". Thanks again to all the users of Arachno SoundFont! Two weeks ago, I introduced the Arachno SoundFont Game Music Packs, released by a user named NightFright, who compiled complete music soundtracks from famous games (DOOM, Duke Nukem 3D...) recorded with Arachno SoundFont, to be used as replacement music in these games, or listening purposes. During the first half on January, NightFright went ahead and recorded additional packs from some famous DOOM/DOOM II add-on level packs (Icarus: Alien Vanguard, Hell To Pay, Perdition's Gate) and the Chex Quest series (non-violent, children-oriented variants of DOOM), and then, released them on the Doomworld forums, on the Arachno Music Packs forum thread. I updated the website to include these new music packs, and also enhanced the Arachno SoundFont Game Music Packs page with the same layout as the Arachno SoundFont Arrangements page, with additional information, such as game data, track lists (with their composers, and links to YouTube videos if available. I also mirrored and hosted all the music packs on my alternate Free download server, so you can download them directly from this website. And, if you can't download them from this server, I also added all the download links provided by NightFright himself, hosted on free filesharing services such as SpeedyShare. Remember that these packs have been made to be added on the original games, so you can benefit from enhanced MIDI music with Arachno SoundFont, without having to install any new software or hardware MIDI synthesizer on your computer (such as CoolSoft VirtualMIDISynth, SynthFont or BASSMIDI Driver). Of course, you can also download these music packs to listen to the music tracks outside of the games, on any device you want! Thanks again to NightFright for his efforts in supporting Arachno SoundFont! To begin this new year with new exciting contents, I'd like to introduce the new Arachno SoundFont Game Music Packs, released from last month to these days by a user named NightFright. NightFright took the original MIDI files from Duke Nukem 3D, DOOM, DOOM II: Hell on Earth, Final DOOM and the "Plutonia" add-on series (Plutonia, Plutonia Revisited and Plutonia 2), and converted them into MP3 or OGG files using BASSMIDI Driver and the AIMP audio player/converter. These packs have been made to be added on the original games, so you can benefit from enhanced MIDI music with Arachno SoundFont, without having to install any new software or hardware MIDI synthesizer on your computer (such as CoolSoft VirtualMIDISynth, SynthFont or BASSMIDI Driver). You'll find all the links to download these new music packs in the new Arachno SoundFont Game Music Packs page. And if you want to listen to one of these music packs before downloading them, you can check this video from a user named Diamhea, who compiled and uploaded the whole Plutonia 2 music pack with timestamp links to switch between all the tracks. I also added some new arrangement videos made with Arachno SoundFont by Daniel Gregory, entitled Cloud Nine and Theme of Nostalgia. You'll find his new stuff on the MIDI Arrangements made by users of Arachno SoundFont page. Many thanks to him as well! Arachnosoft is 13 years old today. As a result, I wanted to refresh a section which has always been there: the articles. Available since this website has been online back in 2000, the initial goal of this section was to explain three recurring subjects of the website back then: free software (freewares), software development (programming, to be exact), and emulation. Since then, these three articles did not benefit from significant updates, only to be translated in English when the website became available in this language. So, I decided to update this section with new contents, mainly focused on IT subjects, tutorials, reviews and feedbacks I wrote on other websites about given products. The goal being to merge all my externally-written contents in one place, to be sure that they'll always be available and updated independently. To start with new contents, I wanted to give you some feedback about installing a SSD into an old computer with IDE port, an upgrade operation I made more than six months ago on a IBM ThinkPad X31 ultraportable laptop, which asked me to search for multiple information, and I thought that synthesizing all these search results in a single article would be helpful for people willing to do the same operation. Other articles will be progressively added, either being specialized IT tutorials like this one, or more generic reviews of products I had an experience with, which could be lacking reviews anywhere else. Now, you'll have to tell me which type of articles you'd be most interested in, by answering the poll on the right-hand side of the website. On an other side, I also added, once again, three new videos made with Arachno SoundFont by The Ultimate Doomer, who remains the most prolific user: a video from the Sonic X TV series, a video from the Dementia II game, and a musical theme inspired from Mametchi the Vampire, a character of the Tamagotchi franchise. You'll find his new stuff on the MIDI Arrangements made by users of Arachno SoundFont page. Thanks again to Ultimate Doomer for his support! 11-03-2013 (8.9.4) : Some new Aracho SoundFont user arrangements! Today, I added some new video tracks released on YouTube by some of the most prolific Arachno SoundFont users. The Ultimate Doomer released several tracks from Duke Nukem 3D, Plutonia 2 (add-on for DOOM II), Monster Bash and The Terminator series of games by Bethesda Softworks. On his side, Daniel Gregory released several new tracks and experimentations recorded with Synthesia, just like Richard Forhenson who did the same with Piano From Above, a similar piece of music learning software. I also added new arrangement videos from two users nicknamed scanmangr and ogu19950405 who chose to cover traditional and classical sheet music. As usual, you'll find all these new videos on the MIDI Arrangements made by Arachno SoundFont users page. Moreover, on the Arachno SoundFont Promoters and Tutorials page, I added a video review of Sound Chaser for the Tandy Color Computer 3 made by randomrodder who used a separate laptop computer with Arachno SoundFont and VirtualMIDISynth to demonstrate the features of this music player. Once again, thanks to all Arachno SoundFont users! After adding several MIDI arrangements produced by users of Arachno SoundFont these last months, I thought that it was time to release a new arrangement on my own! This time, I took a quite famous MIDI file composed by a Lemmings fan named Xky Rauh, who mixed several tracks from the original game into a single MIDI file, simply named Lemmings - Medley. To illustrate this 12 minutes long arrangement, I chose to release it with a video of the original MIDI file played on a virtual keyboard, with the score displayed as a piano-roll, recorded with the Synthesia software and, layered on top of it, some screenshots from the original video game. Level 16: Don't Do Anything Too Hasty ("London Bridge is Falling Down"). Just like the other arrangements, this track is available for preview and download on the Arrangements section, as well as on my YouTube, Dailymotion and SoundCloud channels. Recently, I got some feedback from several users who experimented difficulties to download Arachno SoundFont from the official Arachnosoft.com servers and mirrors. Therefore, I uploaded Arachno SoundFont on some alternate external web hosting services, and, as some users previously did the same, I added all these links as alternate download sources on the Arachno SoundFont download page, both in sfArk-compressed and plain uncompressed SF2 variants. I hope that these additional mirrors will help everybody to get Arachno SoundFont, especially outside Europe. Moreover, I also added some new video tracks released on YouTube by Arachno SoundFont users, including Duke Nukem II & Duke Nukem Forever stuff by The Ultimate Doomer, three Synthesia MIDI tracks by Daniel Gregory and a t.A.T.u. - Vse Normalno cover from Joey Quint', a Street Fighter II cover by lion589, and two game MIDI recordings by Licentious Howler, including a new recording of DOOM's E2M1 "I Sawed The Demons (Deimos Anomaly)" which I recorded back in 2009 as one of my first MIDI arrangements. Thanks again to all Arachno SoundFont users! 08-18-2013 (8.9.1) : New stuff from Arachno SoundFont users and fans! People using Arachno SoundFont have been quite prolific these last weeks, with more than ten new videos and audio tracks released on YouTube, SoundCloud or other channels, and some new articles from several websites. As usual, I had to thank all these people by adding their work on my made by Arachno SoundFont users and Arachno SoundFont promoters pages. But, this time, I went further on and decided to integrate arrangements made by Arachno SoundFont users on my usual MIDI Arrangements page. As a result, you'll now find this page to be splitted into two distinct categories: my own "official" MIDI Arrangements, and the MIDI Arrangements made by Arachno SoundFont users. Thanks to this integration, you can now preview all user-made arrangements directly from this website, just like the official ones I made. The layout of the page has been revised as well, with new information for each arrangement. ... and many more from Foxczer, Kikatzu, SuperPierone, TheRunefox, IterHomini and other Arachno SoundFont users. As usual, many thanks to all of you. Your efforts and devotion to promote Arachno SoundFont are priceless and are the best reward I could ever expect. 07-01-2013 (8.9) : New DOOM II arrangement: Shawn's Got The Shotgun. A new track from DOOM II: Hell on Earth, named Shawn's Got The Shotgun, is now available for preview and download from the Arrangements section, as well as on my YouTube, Dailymotion and SoundCloud channels. This is the track from the seventh level of the game, named "Dead Simple". Its composer, Robert C. Prince, has been inspired by Slayer's "South of Heaven" to produce this energic score, perfectly suited for Arachno SoundFont's electric guitars, synth leads and basses. Check it out! I also updated the list of the audio tracks made by other artists with Arachno SoundFont to include new compositions by Foxczer, Cose Vidal and other talentuous devoted Arachno SoundFont users. Many thanks to them! 04-01-2013 (8.8) : New arrangement: Arachno SoundFont's Electric Guitars. Following the tribute I made to all musicians who have been using Arachno SoundFont since its release, I decided to record a new arrangement, named Arachno SoundFont Electric MIDI Guitars Demo. Child in Time by Deep Purple (from a MIDI file by Gennaro Marchese). As its name indicates, this arrangement mainly focuses on the electric guitar presets (overdrive/distortion) you can find in Arachno SoundFont, with great parts extensively using them. 03-17-2013 (8.7) : My tribute to all devoted users of Arachno SoundFont! Arachno SoundFont is becoming more and more popular, and is now being used by several artists around the world, who wrote articles or composed music with it. As a tribute for their support, I wanted to feature their work on two new dedicated pages: articles and tutorials from Arachno SoundFont users, and a list of some audio tracks made by other artists with Arachno SoundFont, that you can also find as a dedicated playlist on YouTube, named "Made With Arachno SoundFont". Thanks to all those who are actively promoting and spreading Arachno SoundFont! 02-03-2013 (8.6) : Liked my work? Share it on your social networks! Arachnosoft is now open to the social networks, as you can see with the Facebook, Twitter and Google+ buttons you'll now find on top of each page or on the left menu. You can now recommend this website to all your contacts with a single click! Other social networks could be added in the future; until then, thanks for your support, which motivates me further on, to work on projects such as Arachno SoundFont, my music arrangements, music tracks and my software. 12-04-2012 (8.5) : A new arrangement from Day of The Tentacle. Site is twelve years old today, so here is the usual big yearly update! First, I've prepared a new arrangement recorded with Arachno SoundFont, from Day of the Tentacle this time; this is the famous opening and introduction sequence from the game, explaining why you'll have to guide Bernard, Hoagie and Laverne to prevent the evil Purple tentacle from enslaving the world! As usual, this track is available for preview and download on the Arrangements section, as well as on my YouTube and Dailymotion channels. In the meantime, I've also opened my own profile pages on SoundCloud and Last.fm featuring all my audio tracks (both music and arrangements). This way, you'll now be able to listen to all my tracks directly, through streaming, without having to download them first, and leave me comments if you wish. The Arrangements and My Music pages have been updated to include this streaming/preview feature. Moreover, I also updated the Arachno SoundFont documentation to cover another SoundFont software synthesizer you can use with Arachno SoundFont, named CoolSoft VirtualMIDISynth, similar to the BASSMIDI Driver I told you about some months ago. Another rock-solid free software solution to enhance your MIDI files with SoundFonts! As a final note, thanks to all the valuable user feedback I got about Arachno SoundFont during the last few months, you can now download an alternative ZIP distribution of Arachno SoundFont 1.0 which includes the SoundFont in plain .sf2 format, in case you'd have any difficulties to extract the .sfArk file found in the original distribution; I also updated the documentation to include procedures on how to decompress .sfArk files under Mac OS X and GNU/Linux. Thanks to Philippe and Jean-Paul for their tips and information about Mac OS X and GNU/Linux, respectively! Just like them, I'll always be pleased to receive feedback about my Arachno SoundFont, music or arrangements. So, feel free to drop me a line! 07-15-2012 (8.4) : New software SoundFont synthesizer: BASSMIDI Driver. A year ago, BASSMIDI Driver, a new free software SoundFont MIDI synthesizer, has been released on the internet. Having spent many time since to test it with Arachno SoundFont, I thought that it was mature enough to be covered on Arachno SoundFont's Documentation. BASSMIDI Driver is a software SoundFont synthesizer which installs itself as a new MIDI output device on Windows, so it can be used from any MIDI-enabled application or game which renders MIDI data through an output MIDI port. Just like SynthFont, it doesn't require any specific MIDI hardware or software and delivers very good results with Arachno SoundFont. It's the best solution if you just want to play MIDI files using SoundFont banks from your favorite player or game, avoiding bugs and limitations from your hardware SoundFont synthesizer like limited polyphony and note cuts. You can read the updated Arachno SoundFont Documentation to get information about this driver. 12-04-2011 (8.3) : A little section sweeping for the website's 11th birthday. Better late than never! This year, I've been actively working on whole new versions of my software, starting with Precise Age Calculator, which will be available for free on several operating systems, including Windows, Linux and Mac OS. But as it is still work-in-progress which needs proper packaging to be released as a final product (documentation and setup program), it wasn't ready to celebrate this year's website birthday. As a result, I've prepared something else this time; the Software Links section has been entirely swept up, to start including software I use everyday. As usual, it will be completed from time to time. Don't forget to suggest your favorite software as well! That said, if you want any information towards the new incoming software (which I hope to release soon next year), feel free to drop me a line! 02-20-2011 (8.2) : Mario and Zelda await you with 2 Nintendo arrangements. Two new musical arrangements from famous Nintendo games are now available for listening and download in the Musical Arrangements section: the introduction and main theme from "The Legend of Zelda", and the ending credits soundtrack from "Super Mario Bros. 3". As a result, the section now hosts 7 arrangements recorded with the SynthFont software synthesizer and my newly released Arachno SoundFont. As usual, these arrangements are available as videos on my YouTube channel, as well as on my Dailymotion channel; the audio tracks (MP3 and OGG formats) are available for free download in the Files download center. Hope you'll enjoy these new tracks from the most famous Nintendo classics! 12-19-2010 (8.1) : The Arachno SoundFont documentation is now online. As promised with the previous site update, the Arachno SoundFont documentation is now available on this website. You can thus review it before downloading Arachno SoundFont to know what this SoundFont bank has to offer. The documentation lists all available instruments, and delivers many information on SoundFont bank installation and usage. With this update, I also fixed several display-related bugs reported on the whole website. Some glitches still appear here and there; they'll be fixed progressively. Hoping, once again, that you'll appreciate Arachno SoundFont, I wish you an Happy Holiday season. 12-04-2010 (8.0) : Releasing Arachno SoundFont for the 10th birthday! Ten years have passed since this website has been online. Ten years, during which I offered the various IT-related projects I've created, from my first software to my latest musical creations. And today, I'm extremely pleased to release my latest project, Arachno SoundFont, a sound bank of 128 instruments and 9 GM/GS drumkits, that you can use to achieve more realistic MIDI file playback and composition. Using this bank, I composed my latest musical tracks, and recorded some MIDI arrangements as well. More than 7 years after this project started, I eventually found the time to write its documentation to release it, today, as a free download, with hundred of MIDI files to play with! Go to the Arachno SoundFont download page to discover this new creation. The project's documentation will be uploaded very shortly; until then, you will find it bundled in the prevously-mentioned ZIP file. I hope that you'll enjoy this new project, and many thanks for your support during all these years! 05-02-2010 (7.6.1) : Super Mario Bros. Crossover, a new online game hit. Once is not always, here is an update focused on only one thing, but a big thing! To continue with the recent renewal of the Online Games section a month ago, I'd like to share a brand new online game with you today. Published only a few days ago, it has already been enjoyed by more than a million players worldwide! An excellent creation in every domain, that I urge you to discover on its dedicated page. 04-04-2010 (7.6) : Five new Flash games in the Online Games section. JOGG, the website hosting the Flash games previously available on this site, went out of the gaming market a long time ago. As a result, I had to bring you some other interesting games to replace the previous ones. That's why you'll now find 5 new Flash games in the Online Games section. Four of them became real phenomenons (Yeti Sports, n, Bejeweled, Balloons) while the fifth is a 3D racing game published by BMW, "PACE" (Pursuit Across Europe). 12-24-2009 (7.5.1) : New Christmas musical arrangement, "Silent Night"! You can now discover a fifth song in the new Musical Arrangements section available since the beginning of the month. This new arrangement is a welcome addition, being a reorchestration of "Silent Night" originally composed for a special "Christmas" edition of the Jazz Jackrabbit game released in 1994. As usual, this arrangement is available as a video on my YouTube channel, as well as on my Dailymotion channel. Please also note that all the arrangements are now available for free download in the Files download center, as promised earlier, in MP3 and OGG versions. Happy holiday season to everyone! 12-04-2009 (7.5) : Musical arrangements for the website's 9th birthday. Although I used to have several ideas to celebrate the website's creation birthday each year, I must admit, this time, that the new stuff I'm going to tell about wasn't among these ideas. Having recently (re)discovered SynthFont, a software synthesizer able to play MIDI files using far much better sounds than those bundled with your computer's operating system, I thought that it might be interesting to demonstrate its capabilities with some original game music files, as MIDI format had been widely used on video games until CD-ROM began to replace floppy disks for game distribution. You'll find these "arrangements" in a new section entitled Musical Arrangements. New section, new name? The difference being that these files have been composed by other people (while the music tracks available in the My Music section have been made from scratch by me). My part of the work being limited to the use of a self-made custom sound bank, to reproduce the files with intruuments you'd not have heard anywhere else with the exact same sounds, and release the arrangements with self-made videos to bring back some of your gaming memories while listening to the soundtrack. As of today, only 4 musical arrangements are available, from the Descent, DOOM, Duke Nukem 3D and Killer Instinct games. You can discover them from this website or my YouTube channel. In the very next days, you'll also be able to watch them from DailyMotion and download the arrangements as separate audio tracks in MP3 and OGG formats. Other arrangements will be available in the future if the concept is appreciated! So, don't hesitate to send me any remarks or suggestions using YouTube or by sending an e-mail. Have a nice listening and see you soon! 02-15-2009 (7.0.1) : My evolution plans for the site's secondary sections. Although years go on, some parts of this website have not really been updated since its creation. Even if it makes sense that My Software and My Music sections are being updated more often, I'm also aware that the articles, links and online games sections are constantly attracting new visitors each day. That's why I decided to update the secondary sections of this website this year. Most significative changes should be focused on the Articles section. More than a simple glossary of some technical terms used on this website, it will become a place where I'll post all the hardware and software reviews I published on specialized websites, either being simple reviews on a particular product, or more complete articles describing all their interesting features. As this website does not really focus on IT news, this major section update will not aim at challenging IT-related news websites, but will help to centralize what I have written on other websites, without having the pretention to publish complete reviews of latest high-tech products regularly. In the meantime, the Links and Favorites section will be also updated, to include, among others, a renewed Partners category, similar to what used to be in the Information section, featuring websites which asked to appear on these pages after linking to Arachnosoft. If you sent me a partnership request with your website in the past, I invite you to contact me if I haven't honored this request yet. At least, the online games section should also be updated with new games to complete the older ones. I must first find Flash replacement games for those previously hosted by JOGG, which have been offline for a while now. As usual, if you have some suggestions, or ideas about interesting games that could be featured on this website, don't hesitate to contact me. To planify these updates, I uploaded a new poll to grab all your wishes for the forthcoming Articles section update. Other polls should follow this one for the updates of the other sections. You should also notice that, since the last update of the website in December 2008, I made some bug fixes, mainly related to the download links and poll systems. If you previously experienced some difficulties to download some files on this website, you should try to renew your requests. Once again, thanks for your support, and hope to see you later for the future major 2009 news! 12-04-2008 (7.0) : Let your environment be mine, in both width and height. Should you be more or less interested by new technologies, there's little probability that you could avoid the trend represented by the netbooks, those very small low-cost computers, designed to be a cheap, light and extremely portable way to access the internet wherever you are, becoming a true alternative to those clumsy heavy bigger-sized notebooks you usually carry on your shoulder. However, despite being useful, these ultra-portable machines also come with something being both their main strength and weakness: a small-sized screen, and its lower resolution compared to the other display devices available on the market. As a result, most of the websites designed to be displayed under a given screen resolution, such as the one you're reading these lines from, now suddenly appear to be barely adapted to this new emerging netbooks market; being in constant growth since the beginning of the year, and with the holiday season approaching, it's not going to stop really soon; and I didn't mention the case of mobile phones, most of them being nowadays perfectly able to surf on the internet just like any other computer. As a result, I thought it would be pretty accurate to start adapting this website so that it can be displayed smoothly on any screen resolution. That's why, after several years spent dealing with a fixed width of 800 pixels, you'll now be able to choose to view this website in stretched mode, automatically fitted to the available space. The "Auto Size/Fixed Size" buttons on the top part of the website serves this purpose. Using it, you can switch to a fixed width display to an automatically stretching display and vice-versa, from any webpage, to your convenience, no matter if you choose to use frames or not, the two display modes being completely independant and self-completing. Nevertheless, this new feature is only a first step: it will quickly be enhanced so you could be able to choose global site font sizes, independently from your browser's text display settings. This kind of feature being somewhat tricky, it requires quite a number of extensive tests. That's why I decided to only enable the size adjustment features in a first time. As usual, feel free to play with it and send any feedback you may have about it. On these final words, let me leave by wishing you an happy holiday season. 12-30-2007 (6.7.1) : In 2008, download links will be alternate! Here is an easy wordplay to introduce some improvements over the file download system of this website. As of now, all files currently available for download on Arachnosoft are mirrored on several servers, so you can choose to get a file from another location in case you'd experience slow download speeds or incomplete downloads, for example. Technically, all files are now available from an anonymous FTP server which you can explore as you want, using a dedicated FTP client, a FTP-enabled file explorer or any conventional Web browser. Additionally, all the files are mirrored on another server hosted by Free, and, as a third alternative, some of the most recent files are also available on the Web server hosting this website. Of course, the usual download process and links remain unchanged: you can still use the links available on any software/music page to get the files you're looking for, just as before. The download page will automatically redirect you to the main FTP server, and switch to another available download mirror if the current one is too busy or unreachable. In any case, you'll always be able to choose another download server manually, if necessary. I've thoroughly tested this new download process to ensure that any file can be downloaded from any server without hassle. Anyway, should you encounter any problem with this new system, don't hesitate to browse the main FTP download server to find the file you're looking for. Of course, you can always contact me for any help. 12-04-2007 (6.7) : A seven years old website: with or without frames? To celebrate quietly, but surely, the website's seventh year birthday, I prepared a somewhat light update, which should nevertheless interest some of you. Effectively, among the comments I get from time to time about this website, many are related to the use of frames. This technology, once massively used to split a webpage in several distinct and independant parts, has quickly suffered from a number of limits, which can be annoying in some particular cases, when, for example, trying to print a whole webpage with its headers and menus, or when trying to browse it with a non frames-compliant software. That's why I'm introducing a new feautre which will allow you to browse this website without these famous frames: you only have to click on the "Disable Frames" icon located in the above toolbar, and you're ready to go. Hence, I invite you to experience this new navigation mode to choose the one you like most, as I actually decided to keep a frames-enabled navigation mode, available for the regular users who could have been disturbed by such change seven years after. To switch from a display mode to another, you can use the same above-mentioned icon. As the implementation of the feature required to change many root concepts of the website, I must admit that I've been unable to work on other significant changes for this year ending update, mainly because of a lack of time. Also, you should be aware that new bugs may arise because of this update. That way, I invite you to report me any suspect behaviour you may be experiencing while browsing this website, with or without frames, of course! That said, let me leave you with all my best wishes, hoping happy holidays for everyone. 06-02-2007 (6.6) : New music: welcome to Green Hills version 2.0! Nearly one year without any music updates, until now! You'll effectively find the new version of "Green Hills" in the My Music section. A music I composed more than five years ago; needless to say that an update was really necessary, not to say more! More than a bare lifting, it's actually a brand new interpretation, entirely reworked from scratch, like I did for "Arabian Feelings" nearly one year ago; new instruments and new melodies for new ideas. Extended by more than one minute compared to the first version, you now have access to more than 8 minutes of music, and, as usual, in IT (ImpulseTracker), MIDI, MP3 and OGG Vorbis formats. Grab it, it's free! Apart from this new music, the website itself did not benefit from any new major update this time. Only some minor internal modifications to enhance, even more, the site's compatibility with W3C's recommendations, even if the current version is naturally compatible with most important browsers and operating systems of the market. And, to finish, let me remind you that I can always be reached by e-mail for any question or comment you may have about this website or its contents. Don't hesitate, particularly, to give me your opinion about this new version of "Green Hills" ! 03-15-2007 (6.5.1) : Windows Vista information and small site updates. First 2007 update to inform you about some small enhancements I've made to the website, as well as some information about compatibility of my sofware with Microsoft's latest Windows version, Windows Vista, released to the public on January 31st of this year. During the last weeks, I had the opportunity to test my software on this new operating system... and, good news, all my applications and games seem to work properly! However, some of them require some special configuration, such as running with administrator privileges, or under Compatibility mode. As a result, I've updated the software page with many detailed information following all my tests, under the Hardware and operating systems compatible with my software section, and I also improved the layout of this section to make it easier to read, despite of the additional information. Nevertheless, you must be aware that I've tested all my software under an English release candidate (non-final) version of Windows Vista Ultimate, running on a virtual machine. Thus, the information I give may not fully reflect what you could experience with my software under a final public version of Vista running on a real computer, but should be pretty accurate anyway. Don't hesitate to give me feedback if you test my software under Vista, or if any information sounds wrong or incomplete to you! Aside my tests, I've made several minor enhancements on the website's pages, mainly to correct some bugs I've found for the last months. As a side note, I'd also like to thank all the visitors who answered to the poll available under the right menu! As a result, I think I'll keep this poll online for a few additional weeks, and update it afterwards. The next major site update should be mainly focused towards interactivity, with members area and forum/guestbook enhancements. Stay tuned! 12-04-2006 (6.5) : 6 years already! Search engine, polls and RSS feeds. The website has been online for already six years, and, as usual, to celebrate this event, I've prepared some nice new features! First of all, you'll be now able to use the new internal site search engine to find information on this website using keywords. I hope that this tool will help you to find the information you've been searching for when you came on this website. For this sixth anniversary update, polls are once again available. They'll allow you to give me your opinion on this website or the subjects it covers, with only a few mouse clicks! The poll I'm publishing today will help me to know for how many time you've been visiting this website; even if there are great chances that you first came to this website when it became available in English, I would really like to have your opinion! And, to finish with this site update, I've also embedded some RSS feeds to the site's webpages. Those feeds will allow you to receive, on your web browser, e-mail client, or any other compatible software, all the news which have been published on Arachnosoft since its creation, automatically and seamlessly. For more information about the use of these feeds, checkout the news page. Well, that's all for this time! Before letting you discovering the new features brought by this site update, I'll have a last word about the search engine. This website used to have an internal search engine by the past, provided by a third-party website. But this new engine has been entirely developed by myself; as a result, it may still contain some bugs, despite of all the tests I've made. Thus, as usual, I invite you to contact me if you encounter a problem while using this search engine, or any other feature available on this website. 08-01-2006 (6.2) : New music, separate archives for MIDI and IT versions. Four years after having composed the first version, the new version of "Arabian Feelings" is now available in the My Music section. And, this time, it's not a game music or film soundtrack, but a music based on my own melodies and ideas, which I started to write in 2002 after having heard a little piece of oriental music while walking on a street. To correct the main defaults of the first version which was quite repeatitive, this new version comes with some new melodies and fresh ideas, mainly inspired from the oriental and "space-sounding" instruments used in it. This music is relatively long, more than 7 minutes, and the download size of the files has grown in consequence (around ten megabytes for each version, except MIDI). For a better management of such huge volumes of data, I decided to release the MIDI and IT versions of all my music tracks in two separate archives; as a result, you'll no longer have to download several megabytes of data if you simply want the MIDI version. Note that if you have already downloaded the archive containing the MIDI and IT versions of one of my two previous music tracks, you don't have to download the new archives, as they contain exactly the same files. This splitting has also been done on the online listening pages: you must now go on two separate pages to listen online to both MIDI and IT versions of my tracks. That said, I'll let you discover my latest creation, without forgetting to encourage you to give me your opinion on it. And, to finish with this site update, please also note that I'll take my summer vacation this month, hence, I'll not be able to answer to your e-mails until the end of the month. Thanks for your comprehension, and hope to hear from you soon! 07-06-2006 (6.1.1) : Site banners update (English and French versions). In order to complete the release of the English version of the website, as of May 16th, I've just updated the banners, so that they can also be available in English. Hence, I invite you to visit the site banners page (available from the Information section of the right menu) if you wish to promote Arachnosoft on your own webpages, or to update the banners you were using until then, if you had already done so. If you chose to directly pickup the images from this site's web server, you shouldn't have to update your pages, as the HTML code and filename of the existing banners have not been modified. 07-02-2006 (6.1) : New music, as well as some language-related updates. I'm pleased to announce that my new music track, "Operation Stealth - The Ballad of J. & J. ", is now available in the My Music section. It's, once again, a game music release, this time from a 1990 video game by Delphine Software, "Operation Stealth", released as "James Bond: The Stealth Affair" in the USA. If you already played this game (or not), I can't do nothing but tell you to download and listen to it. As for all my musical works released since 2006, this new music is available in original IT (ImpulseTracker), MIDI, MP3 and OGG Vorbis formats. Apart from that, since the last major site update, I have been working on several minor site enhancements concerning its multilingual support. Most of these changes have been done silently (ie. without being noticed with a news) and I still have some little things to do. Among these things, the banners need to be updated to be at least available in English language. But, although I don't think that such an update would require a lot of time, as my new music was ready for release, I thought that it would be good to update the website without delay. So, here it is. Depending of the amount of work it'll require, the banners' update may or may not be notified through a news; if you're interested, stay tuned! And don't forget to give me your opinion about my new music... any constructive review is always appreciated. 05-16-2006 (6.0) : The whole website is now available in English version! Great news for non-French speaking people! I am extremely proud and pleased to announce that my two websites, Arachnosoft and FufuWorld, after being online for more than five years in French (my mother tongue), are, as of May 16th, 2006, available in English language as well! So, as you would have guessed, I put a considerable effort for this update, thus considering it as the sixth major version of the website. BUT, even if I took the time to make the best translation possible, you must be aware that I remain a French-born guy, and thus, that this translation may contain grammar mistakes or false-sounding expressions, without considering that I may have mixed both "American English" and "British English". As a result, if you find ANY mistake (even the most obvious one) concerning the writing quality of this English version, I invite you to contact me to report it. The site should be able to detect your preferred language, according to your web browser settings. If it does not, you can switch between the two available languages using the small "country icons" available above the left menu. If you choose a different language from the one which has been automatically selected by the website, please check that your web browser is configured to accept cookies, so that the language setting can be kept from page to page. I hope that this English version will enable you to (re)discover my IT work: free software and music. The whole website is available in English language, but several information have been kept in French for the moment: the Flash online games (as they weren't made by me) and my software, among others. My freeware programs, currently in French language only, will not be updated only to be available in English. They will be available in other languages than French, but only when I'll have fully updated them with new features other than translation-oriented enhancements. So, you'll have to be patient! That said, maybe are you wondering if there's new stuff, in addition to this translation. Well, no! Believe me, it was already hard work to finish this translation, so I'm releasing it now, so that you can first discover it, help me to correct mistakes, and then I'll think about another update ;-). Anyway, I may add some little language-oriented features or correct bugs in the next coming days, without announcing them as an update. So, stay tuned! And, as a final word, if you're just discovering this website, I invite you to read the site news archive to learn about the website's evolution before this major update. Welcome to all worldwide visitors, and thanks for your support! 03-19-2006 (5.6) : Back to the musical world, at least! It had been a long time. I took more than three years to release another musical work, but today, it's here! You'll indeed find, in the My Music section, a new music track, Lemmings - Level 7, which, you'd maybe have guessed it, is, once again, a tune from the video game "Lemmings". But, more than a new music release, a new page is turned today. Indeed, not only being available in several formats (ImpulseTracker, General MIDI, MP3 and OGG Vorbis), this music has also been made entirely with the new version of ModPlug Tracker, OpenMPT, with sounds direcly coming from my SoundFont sample bank, on which I'm working regularly since more than three years. Hence, it contains new sounds, in 16-bit 48 KHz quality, and studied special effects. Moreover, offering from now my new musical work in two very common file formats (OGG and even more MP3) will enable you to bring them everywhere you want, to use them on any software or hardware audio player compatible with these formats, from your computer's media player to your car audio player, without forgetting about your MP3/OGG portable audio player. The release of this brand new music also leads to another change: all my old tunes have been grouped into a single file collection, "Maxime Abbey's Legacy Music Collection", so that you can (re)discover my old works, if, of course, you had such a wish... this change will also contribute to help yourself to make the difference between my old and new musical realisations. Apart from this release, the website also had some internal modifications aimed at enhancing its compatibility with the rules the W3C. If most of these enhancements will appear transparent to you, the scrolling marquee under the top banner got a new feature from those changes: you can now stop its scrolling movement temporarily, simply by positioning the mouse cursor on it, which enhances its readability. That said, you are now free to listen and download my new musical work, and I hope that you'll appreciate the time and work I dedicated to it! And, as usual, I remain available on the forum or by e-mail for any comments, or to report me any problem you'd encounter while visiting this website. 02-12-2006 (5.5.2) : Awards and site banners are available again. No major update this time. I simply reuploaded two information pages which disappeared from the site with the version 5.0: the awards page, as well as the site banners page, for webmasters and webmistresses who whould like to promote Arachnosoft on their own website. 01-10-2006 (5.5.1) : Support this site and its webmaster with donations! For this first 2006 update, apart from some bug fixes (particularly on the forum), I uploaded a donations page to enable you, if you wish, to offer me a financial contribution if you estimate that the work I'm doing for you is worth it. Indeed, managing and updating this website costs me time, but also me: for example, the domain name and web hosting for this site are not free, and must be paid each year from my own pocket. The payment is done online, and is secure; you can give the amount of money you want, by choosing the currency (euros, dollars...) and the payment method (credit card, Visa, MasterCard...), because the transaction is done through PayPal, which is one of the most famous online payment services. Once again, you are absolutely not obliged to do it, the site will remain available freely for everyone, even if you don't participate; but by offering a financial contribution, you encourage me to continue developing and updating this website. 12-04-2005 (﻿5.5) : Forum and members for the website's fifth birthday. However, I think that what is awaiting you for Arachnosoft's fifth birthday should enjoy you, especially if you visited the website while it was still in version 4. Indeed, I'm proud to present you what I've been working on regularly for several months: a brand new version of the discussion board (forum), which disappeared from the fifth version of the website, because of the lack of time I experienced with last year's update! Even if this forum is based on the one which was present with the previous fourth version of the website, it has nothing more to do with it anymore, as it is loaded with lots of new features and enhancements. Have a look... it now supports multiple categories, so that you can better organize your messages; with the new user profile support, you'll be able to keep track of your messages, to edit or delete them; with the support of most bbCode tags (used in many forums including phpBB and vBulletin), you can now have a better control of your messages' contents... Many more things are awaiting you on this new forum, which kept all the ergonomy and features from the previous version, so that long-time visitors of this website may not be lost with this new version. This new site version is also an occasion to inaugurate the members area which offers you a complete access to the forum, but also enables you to save your browsing preferences, or subscribe to the newsletter. If you had previously subscribed to this one, please note that you'll have to renew your inscription if you want to keep receiving it; this operation can be done after creating your member account, what I strongly recommend you to do, of course! If you had already visited this website before, maybe are you wondering what happened to the guestbook? The answer is simple: it is now integrated into the forum, so that you can also use the new features on it! I must however admit that these two new major changes (members area and forum) will be, to say it like that, the only updates to the website this time, apart from some usual bug and error fixes. Maybe would you like to say that taking a whole year for that is long, too much. And you'd be right. But be sure that if I took so much time to do this update, it's mainly because I wanted to release fully functional forum and members area, starting from their first upload. And even if they may still carry some bugs, I think that I took a good time to test them carefully, to avoid a maximum of errors. However, as I advise you at each update, if you notice any glitch or problem with this new version, do not hesitate to go and tell about it on the forum or, if you prefer, by sending me an e-mail. On another side, I'm now going to, as each year after this one, start working on the birthday update of my other website dedicated to Louis de Funès, FufuWorld, scheduled in ten days. And of course, if, until then, the forum or any other scripts benefit from an update, those updates will also be done directly on Arachnosoft as well. I'm now leaving you on these words, to let you discover this update, and, once again, please accept all my apologies for the lateness. Today, to celebrate its fourth birthday, Arachnosoft is back, hosted by Celeonet, with a new design, replacing the old one which had been here for already three years! This new look has been designed to enhance your experience with this website, with better organized pages and a clearer layout; it has also been designed with the long-time visitors in mind, who should be happy to see that most of the elements from the previous version have been kept. Moreover, this new version is totally compatible with Mozilla Firefox, because it is based on a new source code restarted from scratch. I do not guarantee that my pages fully respect the standards defined by the W3C, but the only fact that they are totally supported by Mozilla Firefox (and, so, certainly, by another alternative browsers such as Netscape, Opera and the Mozilla suite) should satisfy a lot of people! Anyway, please be aware that this version of the website is not entirely finished. Indeed, in order to be able to release, without being late, a functional version of the website, I had to set priorities. As a result, if most of the pages from the old version have been reuploaded (apart for a good number of links and favorites, as well as the Flash games - the JOGG.COM is experiencing technical difficulties these days), a certain number of features which were available on the fourth version of the website have not been reuploaded yet; among these features, the guestbook, forum, poll, search engine, newsletter, partnerships... so, most of the interactive elements of the website are not available currently, they'll be progressively reuploaded with the next updates. Also note that what's currently online mainly comes from the previous version. Software and music have not been updated. Even if I'm still offering technical support for the latest currently available versions, I'll now consider the 1.x versions of my software and music to be OBSOLETE. Indeed, I have on my hard disk drive, for a quite long time already, some newversions of my softxare and above all music, made with new tools and new objectives. These versions, even still being in development or finalization stage, are already more powerful than the final versions you can find currently on this website! But my current objective, is to finish updating the website first. I've scheduled the update of my Louis de Funès-dedicated website, FufuWorld, in ten days. Until then, some enhancements will certainly be made, which I'll be able to integrate directly to this site, my both websites being based on the same code. I have quite a lot of work, as you can see! So I'll stop my speech here to go back to work, leaving you with this version of the website which, may I remind you, is not fully finished, hence may contain errors. That said, see you very soon! As you may have seen if you are a regular visitor of the website, Arachnosoft has not been updated for several months, either online or on my hard disk type. The main reason for this lack of updates being without any doubt a (big) lack of motivation from me. Indeed, for several months already, I keep receiving 90% of junk mail in my mailboxes, either spam or viruses: you are less and less numberous to write for comments or suggestions, and the website receives less visitors per day than it used to. Moreover, I'm currently working on a MIDI sample bank for my soundcard (a Sound Blaster Live! 5.1) in SoundFont 2 format, and as I'm more and more interested in music, I often work on it several hours per day. As announced in the previous news, I had plans to do an update of the website in the next coming months, but when I get back to the source code of the site's pages after several weeks or even months without having worked on them, I'm sometimes unable to understand a code I myself wrote, because of a lack of commentaries and indentation. That's why I've just decided, instead of trying to update pages which are starting to be outdated, to completely restart the website from scratch. It will be, I think, easier and faster to proceed like this instead of trying to make new stuff from old stuff. Design, features, ergonomy, security, performances... all must be redone from scratch, all the bugs from the current version must be corrected (I've noticed several MySQL errors on the website recently), while keeping the already implemented features. So, more than ever, I need your opinion: ideas, suggestions, comments? Don't hesitate to send me an e-mail or post messages in the forum, because Arachnosoft is here for you, so helping me will contribute to suit your needs better. I'll try to keep you informed of the evolution of this new versio (the current version of the website will not be updated anymore, unless exceptions), and, in any case, I'll always be here to answer your questions. See you soon on Arachnosoft! 02-04-2004 (4.8.1) : Site banners and Promobenef updates. Moreover, I've updated the site banners page: some of them have been modified, so I advise you to have a look on this page if you are using them on your website, so that you can grab their new HTML codes, to update those present on your website. 01-27-2004 (4.8) : Site transfer on FranceOnLine web hosting services. For this 2004 update, the website has been fully uploaded to its new web hoster, FranceOnLine. We must now hope that no more MySQL database access errors will arise, which were quite frequent on Free. The domain name of the website has also been transferred to the French registrar BookMyName. If you need more information on these two service providers, do not hesitate to have a look on the About page. Apart from these provider changes, no more major updates have been done on the site, only some minor corrections and updates. Among these changes, the ad banner from the HITSME network has been replaced by a new banner from the Promobenef network, the site counters have also been updated (they are currently visible on all the pages, but they'll be replaced, for the next update, by a new script I've coded myself), and the BannerExplode service has been suspended for inactivity. As you may guess, a site transfer from a web hosting service to another is rarely flawless, thus, if you encounter any glitch on the pages (dead links, programming mistakes...), don't hesitate to report them to me. The site celebrates today its third birthday. For the previous ones, a special update had always been scheduled for the event, but there won't be any this year. Actually, I must admit that I did not really work on my websites or software these last days, because of a lack of time and motivation. However, the website is absolutely not left as abandoned: the next update should bring its bunch of enhancements. Moreover, the website will be hosted by a new web hosting provider who, I hope, will be able of a better quality service than Free (who is very nice as an ISP or as an HTML/files hoster, but who actually fails since my website migrated to PHP). 08-21-2003 (4.7.6) : I'm back from holidays to get back to my IT activities. For the moment, I can't tell you when will be the next update, only tell you that some great surprises are awaiting you... but I can't tell more! Once again, thanks for your patience and comprehension. Updating my software, websites and music requires a lot of time and motivation, so keep giving me your opinion and comments on the guestbook or by e-mail. Stay tuned and come back soon for the next site update! 07-31-2003 (4.7.5) : No Internet activity because of holidays. Just a little post to tell you that I'm going on holidays tonight, for 15 days! I'll thus be unable to answer your mails, or work on this website, before mid-August. In any case, as soon as I'll be back from holidays, I'll try to answer your mails as soon as possible. That said, thanks one again for your patience and comprehension, and see you soon! Stay tuned for the latest news (I'll not give any expected release date for the moment!). Like you may have noticed, the site hasn't been update for several weeks... Simply because I will soon have to take the June high-schools exams, the French baccalauréat (equivalent of the A-Levels, or bachelor's degree), I thus have to study before thinking of my IT activities. I'll try to answer your e-mails as soon as I'll have some free time, but it'll become more and more difficult. The development of new software or music versions is also temporarily stopped. I hope I will be able to get back to my work on this website after the exams, expected for the end of June. Stay tuned for the latest news, and thank you once again for your patience and comprehension. 04-01-2003 (4.7.2) : Server crashes: would it be the end? To celebrate this, I've updated the poll to get your opinion about the site's accessibility. Indeed, do you think that you quickly find the information you need, or do you feel sometimes lost? You may now answer to this question! 03-28-2003 (4.7) : Site enhancements to better support server crashes. As I'm unable to solve these problems myself, I've done some noticeable changes on webpages accessing to the database server, so that they can better support server crashes. Also, I've done a fix so that all error messages written in red on the concerned pages can be grouped into a single one written on the top of each page. I've however made another update which may sound more interesting to you, I've put on the About page a link to the detailed website statistics given by Weborama (far much complete than those from Hit-Parade). I know that it may appear to be a very tiny update, but, unfortunately, I can't do anything to solve these server problems, but hoping that they'll be fixed soon. Please accept all my apologies for these problems, the crashes being independent from my website. 03-17-2003 (4.6) : Webmasters: increase the popularity of your website! I'll start by encouraging all the webmasters and webmistresses who want to increase their site's popularity, to subscribe to the Banner Explode! 2 program. It's a "traffic generator" which relies on a very simple system... moreover, as it is a free service, give it a chance! Go on this page to obtain more information and subscribe! You'll also notice that I've added Arachnosoft to several online general web directories. Do not hesitate to add your website as well, by clicking on the buttons and banners which are at the bottom of each page of the website. Apart from that, I've scanned and upload most of the articles published in the Freelog magazine about my software, like I promised you the last time. You can thus read them from my software webpages. You can also notice a new interesting feature for all the public places of the website (forum, guestbook, comments page...): the e-mail addresses are now encrypted. It aims at preventing some malicious bots from indexing them in databases, used then by some disrespectful companies to send unsollicited messages to internet users (what is so-called "spam"). Following the subscriptions to several web directories as I said before, I uploaded a voting page where you can give your opinion about this website for these directories. So, don't hesitate to express yourself as well! And, to finish with good news, let me announce you a nice thing: Arachnosoft has been once more honoured with the Golden Web Award for the 2003-2004 years! It had already received this award for the 2002-2003 years. You can go and see it by yourself on the Awards page! So, that's all for this time... without counting all the usual minor bug fixes and enhancements. Let me finish by remembering you that, as my student schedule is quite random these days, the updates are likely to follow this trend as well! Thanks once more for your patience. 02-13-2003 (4.5) : Site security and compatibility enhancements. This first 2003 update focuses on greatly enhancing the site's security and compatibility with other web browsers than Internet Explorer. Indeed, thanks to a huge number of modifications on all pages, they're now able to detect the web browser you're using, to deliver contents which are compatible with it, by, for instance, removing code which is only supported by Internet Explorer. Hence, Arachnosoft is once again compatible with Netscape, Opera and other web browsers. Please note that it remains optimized for Internet Explorer. Also, pages should be far much faster to load than with the previous update, because I came back to frames to display the site instead of layers. As a result, each time you'll go to a new page, only the right side of the website will be changed, the rest being loaded only once when you enter the site: the time required to download the pages is thus significantly reduced, as you may have guessed. I suppose that you've noticed the enhanced portal page when entering on the website... My father thought that the links to enter on the website were not visible enough... so I corrected that, and added by the way a short description of what can be found on the website... Don't hesitate to give me your opinion about this new layout. On Rapid'Autorun's webpage, I've posted a very positive review of the software, who was published in the January 2003 issue of the Windows News magazine. Next time, I'll also post all reviews which were published in several issues of the Freelog magazine. I also inform you that the IT (ImpulseTracker) versions of my music are now available on The Mod Archive website. Do not forget to visit my Artist page as well! To finish, I inform you that I'm currently working on the new versions of Rapid'Autorun and Calories & Menus, which will be far much powerful and feature-loaded than the previous ones, and which will maybe support skins as well. Some screenshots of what they currently look like are available. Please note however that these new versions are not ready to be released. Indeed, I'm quite busy because of my studies (I take high-school exams in some months), and I've less and less time for my IT activities. The website may not be updated as well for a relatively long time. Until then, I hope that you'll enjoy this new site update, and see you soon! 12-04-2002 (4.0) : A new update after six months... and with PHP! I've beaten my own record... Exactly six months and two days without an update on the website! You must be sure that I'm ashamed for such lateness... But here is a huge update which should reward you for your patience... I hope! Strangely, the Download section has not been updated this time. Unlike the My Music section which contains big news, as I've entirely reworked all my music tracks and converted them into IT (ImpulseTracker) format. So, I can't do nothing but advise you to go and download them, because their listening quality has been greatly improved. And note also that you can now listen to my music online, without having to download the files. File downloads are now dynamic, which means that you only have to use a single URL like http://www.arachnosoft.com/download/?id=file to download any file from this website. This new method will be really appreciated by webmasters wanting to link to my files on their website, as they will not have to wonder if the link is always valid or if it's a link to the latest available version, as these new download addresses always link to the latest version and avoid dead links. Some entries were also added to the links and favorites pages, and the articles page has been enhanced. The online games section has also a new Flash game called Patakess. The Services section now offers updated services: from now on, the forum and the guestbook are "hand-made" tools by me! I hope that no bugs are present on these scripts and that you'll enjoy them. Otherwise, if you had already visited the previous HTML version of the website, all the pages had some ergonomy and visual enhancements. Their source code has been also greatly improved as well. Please note that the site's directory structure has been completely changed, many folders have been renamed, moved... so don't try to reuse the old URLs from the HTML version of the website, as you'd face many dead links! As you can see, this long-awaited update brings so much new stuff that I couldn't detail everything here! So I'll let you discover all the enhancements by yourself. And, as a final work, this PHP conversion of the website should ease the release of updates for the future. So, I promise you that I'll no longer leave the site without updating it for several months! Gloups version 1.1 has been released. If only a few things have been modified on the game itself, a lot of new features have been added using a brand new interface, like, among others: antialiasing and audio CD support, options to use random music and textures during the game, an high-score table, enhanced and optimized graphics, etc, etc. It's a version I strongly recommend you to download, if you have already played the game or not. In the Online Games section, I've added Java Pac-Man, which, as its name suggests, an internet version of the famous Pac-Man. And what a version! Graphics, sounds and animations, close to the original, are awesome and the whole game is very nicely done. A strong recommendation! I'm also pleased to host and present an excellent software which can convert MIDI files into S3M (Scream Tracker III) files, free and functional despite of a few bugs. It's an extremely rare software, I was very lucky to find it, lost among other files on a russian FTP server, and I also managed to obtain the current contact information of the author. Get it! I've also enhanced the favorites and links pages, replaced and added entries, modified some categories... I also added on the front page the new award which has been given to the website, the Golden Web Award, and, to finish, I also added some information about the compatibility of my software with Microsoft's latest operating system, Windows XP, on the main page of the Download section. More than two years after creating them, I've at least updated my first three games, originally created using Klik and Play ("Voit'Casse", "Bill Kong King" and "Le Voleur, les Bourses et le Policier") by using The Games Factory this time. These new versions are mainly to update the games' engine to 32-bit from TGF, to increase its maximum color number up to 32,768 (instead of 256) and their compatibility with more recent systems. But they also bring their bunch of new features (and it's particularly true for Bill Kong King). I've also composed two new music tracks, Arabian Feelings (an oriental-style music) and Denver (the music from the famous animated series), which are available as usual into the My Music section. From now on, you'll be able to ask all the questions you'd have about this site or its contents, on the new PHP discussion board (forum) coded in PHP by my friend Achraf Cherti. I've added some new entries on the favorites and links pages (including a Music category on this one). You can also discover, on my software's webpages, a new Features and Version History section, which, as its name suggests, will give you detailed information about the given software and the updates he received through its different versions. To finish, I made some little enhancements on the pages (use of an icon to show updated contents, external searches opening in a new browser window, partial use of Cascading Style Sheets to manage the site's design) and corrected a few bugs. A new game has also been installed into the Online Games section. This one is called "Concentration" and, as its name suggests, it's a brain game, and more precisely, a memory game. It's very nicely done, like all the others, so don't hesitate to play! I also did some cleanup on my favorite software list, mainly to correct dead links. I've also added YourMailingListProvder.com into the links and three new partners on the corresponding page (LePhoenix.com, BGU Soft and WebHebdo). I've also proceeded to some other modifications: I've added on the front page the "Anneau Français du Shareware et du Freeware" (French Ring of Shareware and Freeware) following the subscription of Arachnosoft to it, moved the site banners on an independent page, added a link on the full-size image display page to close the window, as well as some other miscellaneous changes to the site's pages and structure. I'll first start by wishing you an happy new year 2002, but also by advising all the Sys-Btn 1.0 users to download the new updated version 1.1, which corrects some big bugs which were present on version 1.0. You've almost certainly noticed that a new page welcomed you when you entered on the website, offering you some additional options, like the choice to navigate with or without background music, or to instantly know the date of the latest update, for example. This page will be considered as being the "portal" of this website. I've also greatly improved the top bar, as I've replaced the ad banner (which moved on the bottom of each page)with forms giving direct access to the site's newsletter or search engine. Otherwise, I've done several other modifications: I've slightly enhanced the general layout of the website (bigger titles, darkened scrollbars, coloured forms, use of a new icon for elements which have been updated...), splitted the favorites and links sections into two separate pages for faster loading, made some minor changes to the HTML code of the site banners, added a section about the operating systems in the downloads section, a MIDI version of "Inferno" and the latest version of FMS2MID in the My Music section, the award given by Midipl@nète on the front page... And, as usual, I've corrected some minor bugs. Here is the complementary update for the "done in a hurry" update from November 27th, which also celebrates the first birthday of the website (December 4th, 2000 - December 4th, 2001). I had to do a special update for this event, so here it is! First of all, note that an internal search engine appeared on the website! Powered by Atomz.com, this excellent and very fast tool will enable you to find exactly what you're searching for on this website's pages, simply by using keywords. I'm also pleased to announce the release of my new software, Sys-Btn, Sys-Btn, which will enable you to backup critical system files from your computer, that you'll then be able to restore in case of important system crashes. I'll finish by telling you that a 88x31 pixels button is now available on the site banners page, that existing banners have been updated, and that some mistakes have been corrected on the articles and other site pages. 11-27-2001 (2.6.1) : Unscheduled update due to web hosting suspension. This update has been hence done in a hurry, as the old counters (hosted by MultiMania) had to be replaced by new ones from Compteur.com. Well, I also added a script on my pages so that the frames are always displayed, some links in the corresponding section, and corrected some minor bugs. 09-16-2001 (2.6) : Release of Gloups and availability of my music. I'm pleased to announce the release of Gloups, my very first 3D game coded with Delphi using OpenGL. It's a 3D adaptation of the famous snake game, which must eat things on the gaming area without hitting the walls or biting its own tail. I also have a new passion: music composition! Indeed, thanks to software developed by my friend Achraf Cherti, named FM-Song, I could learn how to compose music through a computer system, and I released my first tracks, for free of course, in a new site section, My Music. You'll also find an information page about FM-Song and its related tools. You can also find in the Online Games section five new games in Flash made by JOGG (www.jogg.com), very nicely done, original, highly coloured and animated. Another information, I've setup a new e-mail address related to my domain name, contact (@) arachnosoft.fr.st. I'd like you to use this adddress to contact me from now on. Apart from that, I also realised some other modifications on the website: I've added two "Previous Page" and "Next Page" shortcuts on the top bar, modified the pages' footer layout and the main menu's vertical alignment... I've also added "Espace Francophone" and "L'Abeille du Web" on my partners page, and created the news archive section. 07-18-2001 (﻿2.5) : Lots of software news and even more! Here is the biggest update ever done to the HTML version of the website, with loads of new stuff. Have a look by yourself! First of all, several software news, starting with the release of Heedeu's Travel, my first game created with The Games Factory (TGF - Klik and Play's new version), a platform game inspired from Super Mario Bros and Donkey Kong Country, and with the release of ResChanger, a Delphi software with sources to run a given application using another screen resolution. Also from the software news, I announce updated versions of Savoir son Age Précis (Precise Age Calculator - version 1.1) and Configuration du Gestionnaire Graphique (Display Driver Configurator - The Games Factory version). Some enhancements have also been made to enhance site's interactivity, with color-changing links when the mouse cursor is over them, a scrolling marquee on the top which gives additional news information, a reorganized and cleaned-up main page, a new dropdown data display which show or hides information when you click on their header's link, a new main menu shortened thanks to this system and displayed on top of the other toolbar, "skinned" scrollbars to match the site's colors, some new textures, etc, etc. I've also setup a new download server hosted by Free, a more complete newsletter service powered by YourMailingListProvider.com and a new dynamic system to display fully-sized screenshots from my software. Three new pages have also been created, the Partners page and the RecoMail (which gives you a tool to recommend this website to your friends!) in the Information section, as well as the Online Games page. I've also made some updates to the favorites and links pages: I've sorted the entries into categories and added some on the way. I also added the site to several web directories and services, like Swisstools and Weborama. Well, that's all for this update full of new stuff... Hope I forgot nothing. As a final word, be aware that these modifications may cause compatibility issues with Netscape. 05-01-2001 (﻿2.0) : New addresses in .fr.st, and site splitting in two parts. Indeed, the Louis de Funès section has been separated from the main site to become an independant website, named FufuWorld, which is now available at http://www.fufuworld.fr.st. The remaining part of the website has been renamed Arachnosoft and is now available at http://www.arachnosoft.fr.st (the old address remains available and will now serve as a portal to these two websites). I've also corrected some bugs related to the newsletter subscription form, and it's now fully functional. Don't hesitate to subscribe then! A new website has been added to the links section: the Pierre Torris Home Page, a French author famous for the quality of his software. Discover also a new external software hosted on this website, a game called Kaboom II, written in QBasic, in the downloads section. Site navigation has also been improved, simplified, thanks to a new, more precise and more complete main menu. I've also restarted from scratch the site banners and done some modifications on the site structure. As you'll surely have noticed, the site has adopted a brand new design, with black tones, giving it a little futuristic touch... What do you think? I've also finished the Louis de Funès section. I took several months for that, but now, it's done! Also discover the new services now available on the website, like the guestbook, the newsletter or the discussion board (forum)! Apart from that, other changes have also been made. I've slightly modified the site layout and directory structure, added keywords on the pages for their search engine indexing, moved the site banners on a dedicated page, added a banner page on the top, renamed the Contact section as the Information section..And, as usual, I've fixed some minor bugs. 03-11-2001 (1.3.2) : New Projects page and miscellaneous optimizations. I've drastically changed the frames display: I deleted their useless borders, gave them a fixed size, which should help the site to be displayed the same way at any resolution. I also corrected some minor bugs on the website. I've created a news section on the main page. So, you'll now be directly informed of the latest updates made to the website from this page. You'll also notice a new layout for the software, favorites and links pages, on which I've also added some new entries. Otherwise, I've also updated the Louis de Funès section, reorganized the site directory structure and deleted the unused form on the Contact page. 02-12-2001 (1.3) : Release of Rapid'Autorun and display optimizations. I'm pleased to annonce the release of my software, Rapid'Autorun. Apart from that, I optimized the site's support for high resolution displays. 01-15-2001 (﻿1.2) : Creation of a left menu and a top bar. The site's ergonomy has been greatly enhanced, as I've added a fixed menu on the left side as well as a top bar, also fixed. You can also discover a very beautiful clone of Pac-Man, named "PAX", very nicely done with high-color graphics, on my favorite software page. I also continued to work on the Louis de Funès section. 12-26-2000 (﻿1.1) : New software and look for the website. Christmas does not prevent me from working on my PC! Look, here is a new site update. First of all, I announce that a new software is now available: "Configuration du Gestionnaire Graphique". The site appeareance has been also slightly modified: I've added some background textures on the pages as well as coloured table borders, it looks at least a little nicer to the eyes. I also continued to work on the Louis de Funès section, created the Contact page, and done some minor modifications on the site's structure. 12-14-2000 (﻿1.0.1) : First availability of the Louis de Funès section. I modified the site structure to host a new section dedicated to my preferred French actor, Louis de Funès. I also made some modifications to the visitors counter. 12-04-2000 (1.0) : Creation and first availability of this website. First availability of the website at http://maxabbey.multimania.com. Currently, 67 person(s) is (are) connected on the website.